BIG Discount on all 2019 bookings, Great Saving off all listed prices you can save over €100 per week, see Availability Prices page. Offer for a limited time only so don't miss out. Our website is being changed to a mobile friendly version, we apologise if there are any errors with the site, please feel free to email us if you experience any problems during this change over. VILLA RIO MAGRO Fantastic Holiday villa for all the family. Modern, spacious villa, amazing mountain views, Swimming Pool, Broadband Internet, Satellite TV (HD Spanish, Uk Sky TV), Table Tennis, 3 Large bedrooms, Outdoor cinema. VILLA RIO MAGRO is perfect for getting away from everything. This is a tranquil, relaxing area so you can enjoy the countryside and amazing mountain views but it is close enough to the towns and cities to see 'Real Spain' and real Spanish life. The villa has a feeling of openness and brightness and is set on a large plot of land with a big variety of fruit trees from lemons, figs, peaches, grapes and more all for you to enjoy plus landscaped gardens. The nearest house is approximately 100 meters away and does not over look onto our villa or gardens so this is very private and very peaceful. THIS IS NOT PART OF A HOLIDAY COMPLEX.....THIS IS A PRIVATE VILLA. It is our aim to make sure you have an enjoyable stay and feel that Villa Rio Magro is your home away from home. *In-house Menu all freshly home cooked for if you don't feel like cooking. VILLA RIO MAGRO is named after the river that flows at the back of the property although this river is now more of a stream due to a damn. The villa was completely renovated in 2008 and is constantly improved on each year to offer you an even better experience.. The villa has a large modern bright feel but at the same time warm, inviting and comfortable. The villa is trastefully decorated and has all the amenities you need to have a relaxing stay. 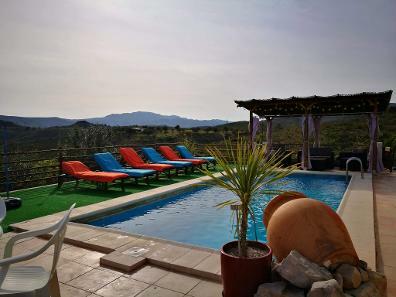 The villa has its own private swimming pool, large terraces and gardens with a large variety of fruit trees, BBQ, Table Tennis, Outdoor eating areas, Outdoor lounge area and Amazing view of the mountains. It is set in a peaceful location and is very private but is only 5 minutes from shops, restaurants and bars and only 30 minutes from Valencia city. Take a look at the Villa photos page for more information.